Dinosaur is one of the most vital and creative new instrumental bands in Europe. 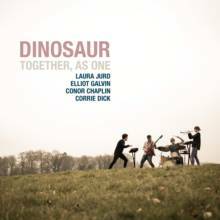 Shortlisted for the 2017 Hyundai Mercury Prize for their ‘masterful Jazz album’, ‘Together, As One’, the vibrant ensemble, led by trumpeter and BBC New Generation Artist, Laura Jurd, has risen to widespread prominence garnering huge acclaim and attention from the world's media. Praised for their idiosyncratic blend of styles – taking sounds from folk, rock, minimalism and contemporary art music, ’Together, As One’ was described by All About Jazz ‘as one of the best debut albums for years’. With a rare 5 star review from The Guardian, front cover feature in Jazzwise Magazine as well as numerous top 10 mentions in the end of 2016 best album polls, the band consequently appeared throughout 2017 at some of the world's most prestigious festivals including North Sea Jazz, Montreal Jazz Festival, London Jazz Festival, Molde International Jazz Festival and Open Jazz in Stuttgart. Laura Jurd, the mastermind and creative force behind Dinosaur, is developing into a formidable force as one of the most remarkable young musicians to emerge in the UK in many years. Switching between trumpet and synth with ease, her music sees contrasting idioms effortlessly collide to create a unique and distinctive world of sound. As a trumpet player, her Milesian sense of space and time, combined with a natural affinity for sonic exploration make her a truly individual voice on the instrument, that delights in bringing the trumpet into new musical territory. A twentysomething musician with a love of songwriters, classical music and Miles Davis, Laura Jurd exudes a playful jubilance in music making, both as a composer and on stage alongside her bandmates and close collaborators. Dinosaur is a versatile and dynamic creature that cultivates the rich history of rhythmic music whilst entering new terrain with a sense of joyful curiosity and inventiveness. A new album due for release in May 2018, followed by further extensive touring will no doubt shoot the band into the international stratosphere. Dinosaur is the new British jazz supergroup making music that could not be made by any other band. ANAT COHEN & MARCELLO GONSALVES "Outra Coisa"
BOSSO, GUIDI - "NOT A WHAT"